What Style Garage Door Is Best for My Home? / Comments Off on What Style Garage Door Is Best for My Home? Is the design of your garage door helping your home’s curb appeal, or hurting it? A garage door is often the first thing people see when they visit. Maybe it’s an ordinary door that functions well, but why not choose a door that makes a design statement? A stylish garage door will not only improve the look of your home, but it can add value to your property. 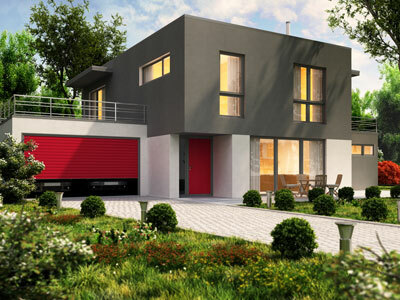 Modern garage doors come in a wide selection of colors and styles. Ponderosa sells and installs doors that are sturdy and stylish. Windows are available with most of our doors, and you’ll often be able to choose a custom color to coordinate with your home. Here’s an overview of some of the most popular looks in garage doors. A brightly painted garage door can be a focal point for your home. Say goodbye to boring doors, because there are some incredible contemporary garage doors on the market today. If you prefer sleek designs, look for doors that combine brushed aluminum and glass. These doors can look industrial or elegant. What sets them apart is their clean design and modern lines. Raised panel garage doors are popular for good reasons. They’re attractive, economical and low maintenance. These traditional-looking doors look great when you choose custom colors, finishes and windows. Raised panel doors are most commonly available in steel, wood or composite materials. Steel doors are strong and can have a faux-wood finish. Raised panel doors are a time-tested favorite and will never lose their appeal. These charming doors trick the eye by echoing the hinged, swing-out door style of a vintage carriage house door. But, like most garage doors, a carriage house door rolls up. These doors are available in wood for a traditional look. They can be stained or painted to match your home. Carriage doors also come in steel or vinyl. These low maintenance, durable materials are great for the wet weather of Washington and Oregon. Carriage doors can be customized to include glass windows and a choice of decorative hardware. It’s important to purchase a door that is weather resistant. For those in the Portland/Vancouver metro area, you’ll want a door that stands up to high winds and lots of moisture. Doors come in various strengths and are rated for wind loads. Ponderosa Garage Doors can help you choose which doors are sturdy enough for your area. No matter what your design preference, a door with style is an investment in your home’s value. Contact us today to learn more about new garage doors.